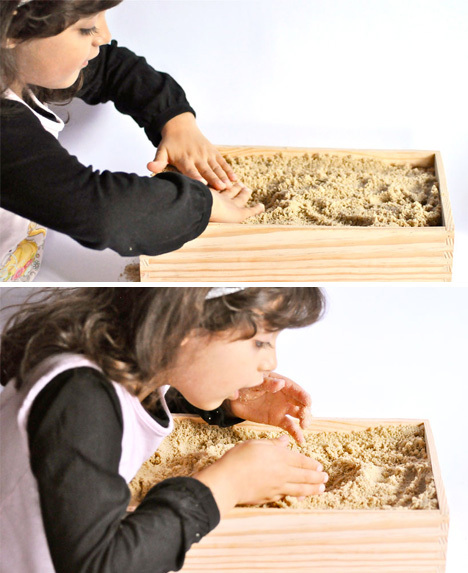 Digging in the sand is a timeless and endlessly entertaining activity. Even after we reach adulthood, the possibility of uncovering hidden treasures in the sand is such an intriguing concept that we continue to poke into it with our toes, explore it with metal detectors and joyfully dig in with bright plastic shovels. 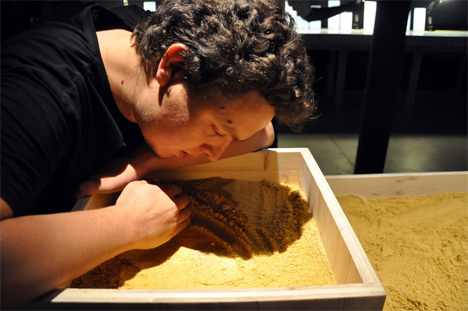 This installation puts a new spin on the gleeful discovery of buried secrets by allowing participants to hide short audio messages beneath the tiny grains of sand. “Sandbox,” an art installation by France-based designers JC Karich, Martin De Bie and Martin Le Tiec, is a playful look at data exchange and the use of natural materials for unconventional communication. 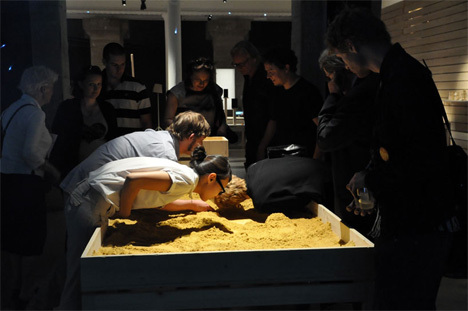 Visitors to the installation dig into the sand to reveal light-sensitive sensor modules. When they uncover a module that has already been loaded with a message, the ambient light triggers that message to play. If the uncovered module is empty, the digger has the opportunity to record a message for the next visitor. The sand in the sandbox installation is normal, run-of-the-mill sand – but the electronics beneath the sand make this project so memorable. 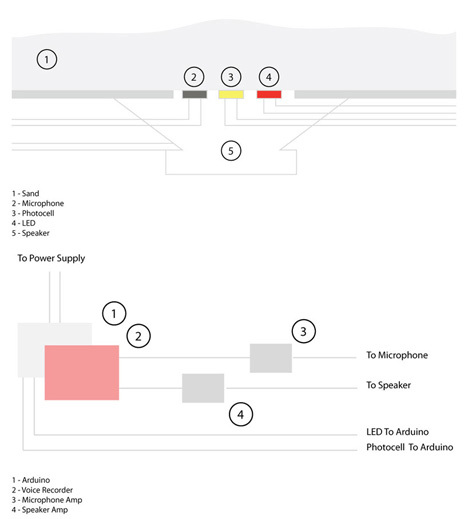 An Arduino microprocessor is attached to multiple control points under the sand; each control point features an LED (to indicate to the user when he’s uncovered a module), a microphone and a photocell. Under the control points are small speakers that play back the collected messages. The fantastic concept was born in the midst of a “hybrid materials” workshop. The unusual combination of a natural material above a hidden layer of electronics creates a wonderfully fun toy for onlookers. But even more attractive than the idea of an unconventional interface is the unbridled excitement that always seems to accompany finding something unexpected. No matter what type of secret or message one might stumble across in the sandbox, we can only imagine that the heart skips a quick beat when that little red light is exposed for the first time.